This is a post several months in the making. I’m only able to write about it now because it’s officially resolved and I’m satisfied with who I should name, who I shouldn’t name, and what the costs have been to me as a homeowner. As I’ve mentioned before on this blog, I’m very careful about naming subcontractors on this site because Google search results have the ability to make or break someone’s business, depending on what is written about them. Did a great job, would recommend. So far, almost everyone has fit into this category. If you do a great job, charge me a reasonable fee, and are someone I’d recommend to others, I write about you here and link to your site if you have one. Hopefully this leads to more business for you. My landscape person, Alex at Alexandria’s Creations, recently told me she’s gotten a several new clients from this site, and I haven’t even written the final glowing post on the landscaping yet. Things didn’t go well for one reason or another, but the person was honest and tried to make it right. In this situation, I write about the process but keep the contractor’s name out of it. Only a few subcontractors so far have fit into this category. If I wrote about the entire process and named the company, it would have the effect of casting the company/person in a negative light, and I do not wish to do this. If you are honest and tried to make things right, you shouldn’t be subject to a full writeup about everything you did wrong. Things were a disaster and I want to publicly warn readers to stay away. Nobody has fit into this category yet, but there have been a couple of situations where the final resolution saved someone from this group and put them in the previous group. I don’t tell any workers about this system and I’ve never used it as an overt incentive/threat in order to get anything done. Not a single time. If you’re working on my house and you happen to find out about this site, you can draw your own conclusions as to how you may show up on it, but in most cases, people don’t even know about it until they get referrals weeks or months later. In planning the “grand entrance” for the house, we had a lot of choices: bamboo to match the floors, concrete to tie in with the steel, slate to keep things affordable, and linoleum to completely ruin the entire project if we so desired. We liked the idea of concrete the best, but because of the existing subfloor elevations and some weight issues, we couldn’t do a full, thick poured concrete floor. We were turned onto a product, however, that’s been around for quite awhile now called a “concrete terrazzo overlay” or “decorative concrete overlay” floor. It’s essentially a poured floor made of concrete and aggregate but is only an inch and a half or so thick. It was about the most expensive option available at about $9,500 for 400 square feet. This cost included in-floor heat, but it was still probably twice the cost of something like slate. Nevertheless, it was a very public part of the house, so we went for it. Around the beginning of February, work started on pouring the floor. It was only supposed to take a week or so, including the 7-step polishing process, but it ended up taking about 2.5 weeks. A loud, dusty 2.5 weeks. When the grinding and polishing was almost done, I noticed several cracks across the floor, some of them pretty major. Concrete workers always warn you that you should expect a few cracks when you choose concrete as a floor option, but given the fact that the thing wasn’t even fully installed yet, I freaked out a little. The company tried to fix one of the cracks and it seemed to make things worse. I wasn’t feeling very good about things at this point, but we couldn’t hold up the rest of the construction and needed to cover up the floor with protection for the next few months as other work continued. Given the fact that the company needed to come back towards the end of the project anyway to do the final polishing, the decision was made to just deal with it then (incidentally, I don’t recommend doing this… deal with everything at the time, if you can). Well, a few months went by, we completed most of the rest of the house, and it was time to uncover the floor and bring it up to snuff. To our surprise and dismay, there were now over 20 cracks in the floor. 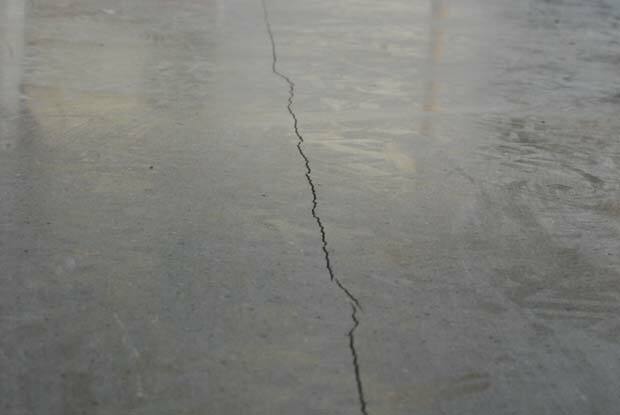 Mind you, none of these cracks were concerning from a structural standpoint as they were all hairline in size, but to have your brand new concrete floor dominated by very visible and ugly cracks is disappointing to say the least. We called the owner of the company in to have a look and were a bit worried he’d say this was “completely normal”, but even he agreed this was out of ordinary and not something he anticipated. One of the approximately 20 cracks. This was the worst one. We had two options: try to fill the cracks with color-matched grout or grind the whole thing down and do something else on top of it (like more of this product or maybe ultra-thin slate tile). The decision was made to try the grout option first as it had the least project/cost impact. Unfortunately the grout ended up making the cracks even more conspicuous. At this point, we called the company back and expressed our disappointment with the grout fix. The company did not immediately return our e-mails so we prepared ourselves for a situation where they would walk away from the project (I had paid them about $8000 so far and still owed about $1500). Build recommended we call a company they’d used before called Cirvell that uses a product called Milestone, which is essentially hybridized portland cement. The product has a “hand-troweled” look and isn’t as “shiny and pristine” looking as the concrete terrazzo overlay, but at only a sixteenth of an inch in thickness, it could be troweled on top of the existing floor with no grinding whatsoever. We informed the original concrete floor company that we were proceeding with the Milestone option and that we felt a refund of half of the fees paid so far was a fair arrangement for both parties. This would leave me paying $4000 for a heated concrete subfloor, plus $2500 for the Milestone coat. To his credit, the owner of the original concrete company sent us a check for $4000 and we’ve now parted ways, sadly but amicably. Although I was obviously not happy with the concrete terrazzo floor, the way the company owner handled the refund showed me he was an honest guy and someone who cared about the quality of the product and service he was providing. He could have easily just walked away and stuck me with the bill, but making things as close to “right” as possible was important to him, and that is why I’m not interested in steering readers away from his product. He’s no doubt done hundreds of successful floors… just not mine, and for we know, there was something about the construction, or temperature, or humidity in this job which conspired to not let the product cure correctly. Thankfully, the folks at Cirvell were able to give us an end result which we’re quite happy with. They completed their work in only a few days, for a reasonable cost, and have graciously offered to come in and fine-tune the tint of the floor after we move in, if we desire. 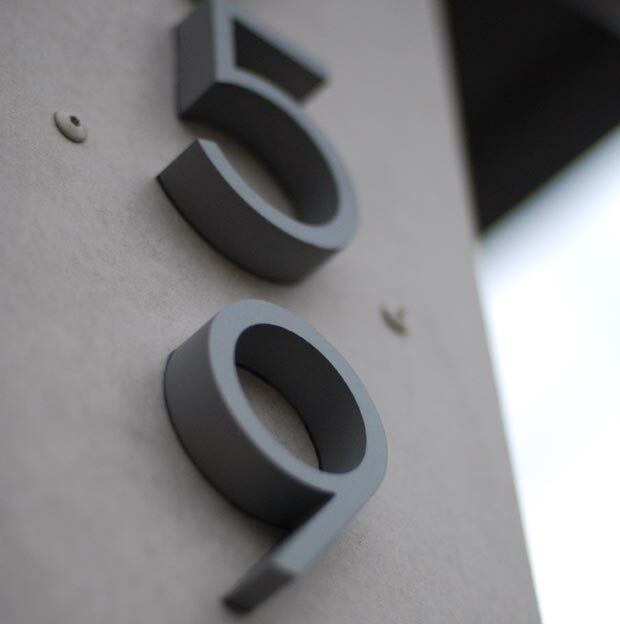 I do not hesitate to recommend them if you’re looking at Milestone as an option in your own home. Here’s what the finished product looks like now. Plus one for Milestone. … and with that, the concrete saga is thankfully resolved. For more photos of the floor, please visit the photo gallery. A couple of weeks ago, I posted about the concrete floor saga. Unfortunately, this wasn’t the only “adventure” related to the flooring throughout the house. The whole bamboo situation was arguably even more stressful. I’ll start from the beginning. In deciding what sort of wood to use on our floors, the girlfriend and I both dug bamboo for its modern, natural appearance and its sustainability (bamboo is actually a grass and not a wood). We would have been perfectly fine with a nice durable hardwood like brazilian cherry but bamboo was the first choice. In researching bamboo, the first thing we discovered was the janka scale. The janka scale measures the hardness of wood and is the primary indicator of how easily your floors will dent. I have a friend with a cheap, engineered bamboo floor and he swears he can dent the thing just by dropping his keys on it. This cheap bamboo is likely in the 1100-1200 janka range and is super-thin as well, making it a poor candidate for durable flooring. On the other end of the scale is strand woven bamboo. Weighing in at 3000 or more on the janka scale, only a few woods are harder. Strand bamboo has a distinctive look to it that you may or may not be into, but it’s virtually indestructible, so we specified it. The first misstep in the bamboo saga occurred here. The wrong bamboo was ordered. Instead of receiving strand bamboo, we received Teragren Signature Naturals vertical grain caramelized bamboo in 3/4 inch thickness. While the non-caramelized variety averages a healthy 1876 janka, the caramelized version is about 30% softer (caramelizing or “carbonizing” is the process of cooking bamboo so that it darkens naturally, the side effect being that it softens). Since the bamboo looked really nice and was a from Teragren, a company known for its quality, we decided to see if we could just exchange the caramelized stuff for non-caramelized. The distributor agreed to make the exchange and we then accepted a new shipment of non-caramelized bamboo, which we’d just darken via staining. The color we were going for was slightly darker than natural blonde bamboo; a color sometimes referred to as “honey”. Here is when the real (non) fun started. When the company doing our floors laid the first coat of stain down, the edges of each floor board collected stain in a manner inconsistent with the faces of the planks. The result was a light colored floor (good) with dark outlines around each board (terrible). One of the many reasons we went with a site-finished floor instead of a pre-finished floor was so the floor would be one even, seamless, gapless piece of awesomeness. A close-up of the darkness between boards. The inital stain was much lighter than this so you can see how these seams would ruin the appearance. The flooring company, recognizing the problem, offered to re-sand the whole floor and lay down a different treatment. Unfortunately, however, every attempt to slightly darken the floor resulted in these unsightly outlines around the boards. I then began calling around to other flooring companies, including a very highly regarded one on Bainbridge Island, and to my surprise, some companies told me they refuse to stain bamboo for this very reason. Apparently, stain does not take evenly to bamboo and getting it to look right is more trouble than it’s worth. Would have been great to know ahead of time! Especially from the flooring installer! Faced with this new information, we had two choices: keep the floor blonde or stain it much darker so the dark spots between the boards would blend in. We ended up choosing the latter. Unfortunately the fun didn’t end there either. When the stain went down, we were actually pleasantly surprised with the look. It was more or less the color of teak, which is kind of original for a bamboo floor. When it dried the following day, the entire floor had to be covered up with protection so the rest of construction could continue (much like with the concrete floor). I noticed what I thought were some shoeprints around the edges of the walls, but since the flooring company had to come back in a few months to do the topcoat, I figured it would get fixed at that time. When the construction started wrapping up a few months later, the flooring company came back out to put a swedish finish top coat on. Unfortunately, not only did they coat over the shoeprints, but they actually weren’t shoeprints. Turns out they were “chattermarks” and they were all around the perimeter of the main floor. Chattermarks are essentially scratches in the surface caused by subpar sanding. The stain from the bamboo collected inside the scratches and that’s why they looked like shoeprints. When I complained, the flooring company came back out and tried to repair the situation using some floor tint, but it only made things worse. Although I hate making people redo work, the owner of the company agreed that this was not up to his company’s quality standards and that they would re-sand the entire floor again and make things right. Although it ended up adding another week or so to the construction schedule, the floor was re-sanded and the situation was resolved. We now have a beautiful, teak-colored, site-finished bamboo floor, that should be hard enough to withstand thousands of key drops and other accidents. The finished floor looks really great, and although it was a long process, it turned out beautiful. 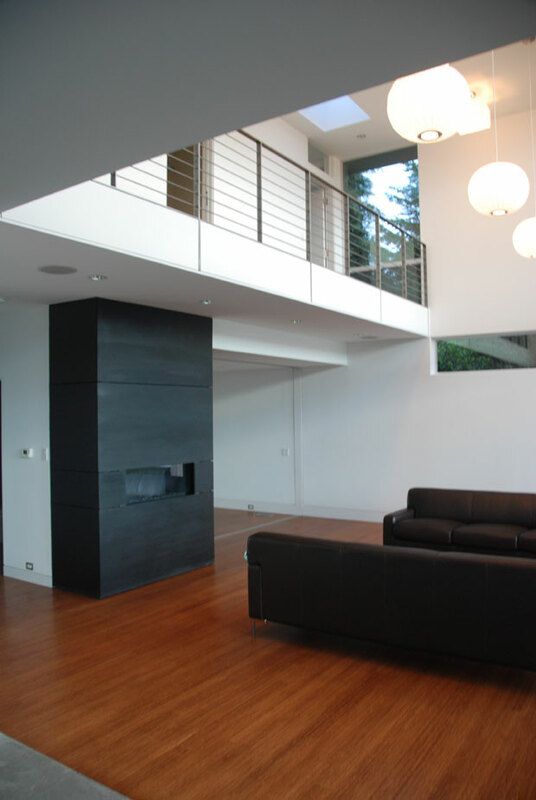 If you choose a bamboo floor, either stain it dark or don’t stain it at all. Plenty of colors are available if you go pre-finished, but site-finished floors are generally regarded as higher quality. 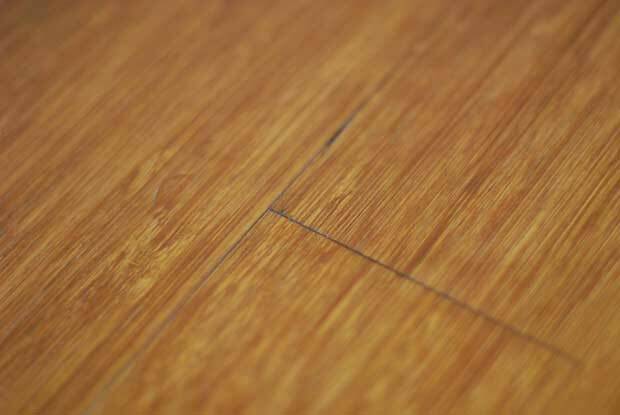 If you are looking at strand bamboo, the two best samples I found were from Plyboo and Duro Design. Investigate the janka rating of whatever material you’re thinking about and choose something above 1500 unless you don’t care about denting. Quiz your flooring company and find out if they’ve ever worked with the product you’ve chosen. If I had known the company doing my floors had never stained bamboo before, I would have either chosen a different product or a different flooring company. Companies may not volunteer that they’ve never worked with a certain product before because they assume it’s not much different than what they’re used to. 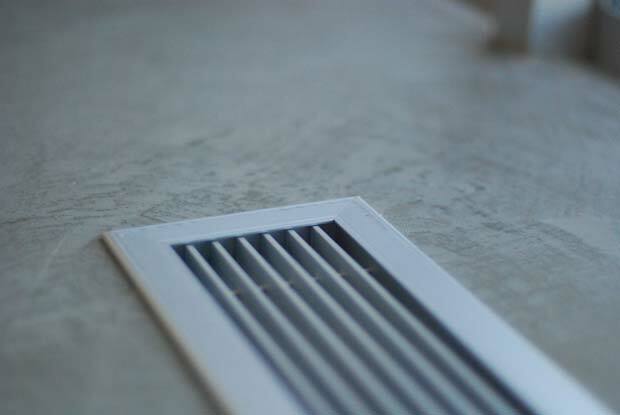 Just like with the concrete floor situation, let your installer know right away if you’re not happy with something about their installation. You may still both agree to deal with it at a later date when construction schedules permit, but get it on their radar and hold back an appropriate percentage of payment until it is dealt with. Bathrooms are a big deal. People sink a lot of money into them because of the labor and materials involved, but rarely do homeowners take a close look at the usability of their prospective new bathroom before opening their wallets. This post will discuss how we planned our bathrooms and what guidelines you should follow when designing your own. Most of this post will concentrate on the master bathroom, but one question that will come up early in your project is “does each bathroom need its own distinct personality?” Because of the wealth of materials and styles available, many people are tempted to design each bathroom to be much different than its peers. We designed our bathrooms in partnership with The NB Design Group and Build and both companies advised against trying to get too cute with individual bathroom styles. Each can have some distinct qualities, of course, but when you walk through someone’s house and one bathroom looks like the “aquarium” one and one looks like the “dark marble” one and another looks like “spartan” one, it tends to look a little forced. For this reason, we decided to follow the same general color and tile scheme for all of our four bathrooms. Some are nicer than others but they all look like part of a family. 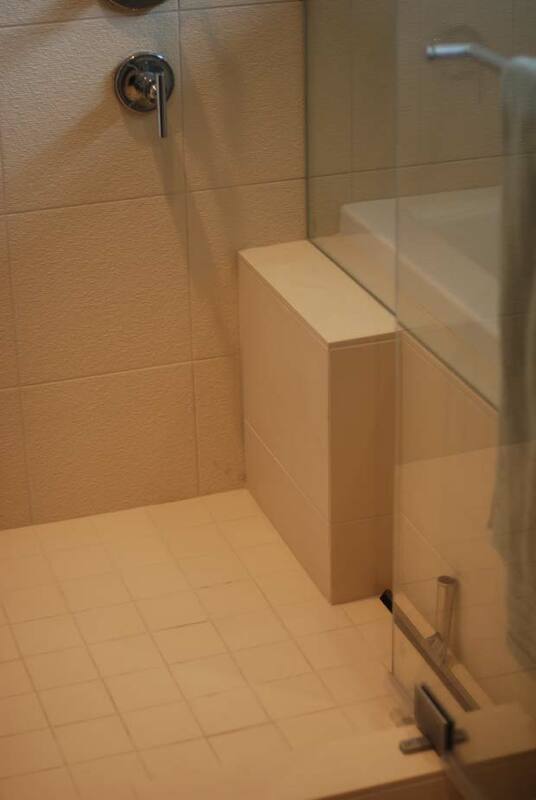 To me, the most important thing to get right in a master bathroom is the shower. You’re going to use it every day, and many times — if properly designed — it’s going to transport you from a murky web of morning grogginess and hangovers to a refreshed and invigorated state. Not only do you want to eliminate the common problems with showers but you also want to add the best components you can in order to maximize awesomeness. This is something you can do without building a brand new house by the way: take care of your shower and main bathroom and you’ll leave for work a much happier person. If the most important part of the bathroom is the shower, then the most important part of the shower is the showerhead. 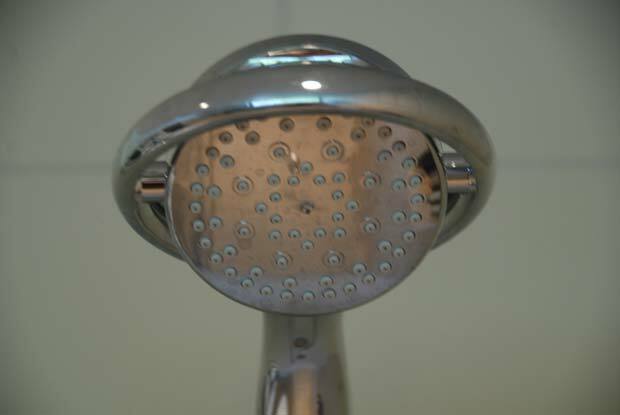 I am a bit of a showerhead snob and we went through six heads before finding the perfect one. I will just go ahead and save you the time and tell you what the best showerhead in the world is: The Kohler Flipside. It is truly an amazing showerhead, and if you’re reading this blog without having started your new home yet, just do yourself a favor and buy it. They are on sale for $71 at Home Depot right now. You can easily remove the flow restrictor, creating an torrent of spray even Cosmo Kramer would appreciate. 3 of the 4 spray settings are wonderful. One feels like you’re going through a carwash. The problem with most multi-setting showerheads is that usually only one setting is good, and on that setting, you’re only using maybe 20% of the head’s nozzles. On the Flipside, you’re using all of the nozzles on whatever face you’re flipped to. It has a built-in handshower. Both the girlfriend and I actually agree that it is the best showerhead ever, and we never agree on showerheads. This showerhead is so good that I may buy an extra to have around for when this one needs to be replaced and it is inevitably discontinued. Even if you’re not going to take my advice on the Flipside, make sure you have a shower arm installed that fits all standard half-inch showerheads. Originally we had a Kohler Purist showerhead (beyond terrible) and arm installed and unfortunately the arm is not separable from the head. This is a huge design problem, in my mind. A homeowner must be able to experiment with different showerheads and find their favorite. You should have your shower lines run with 3/4 inch piping (as opposed to 1/2 inch) in order to make sure you have enough flow to do what you want. Similarly, pay special attention to what valves you specify. We originally had a standard Kohler thermostatic valve spec’d that not only was meant for a different type of system (the type where you control volume and temperature on the same knob), but also it only allowed about 5 gallons per minute through. If you have anything special in your shower like bodysprays, you’re going to need more than 5 GPM. We ended up installing the excellent Kohler 669-KS which will let a whopping 17.2 gallons per minute through if you want it to (which of course, we don’t). The most important thing about shower controls is that they should not be placed underneath the showerhead. At least 90% of showers get this wrong, probably just out of builder convenience or laziness. You should be able to step into your shower, fiddle with your knobs, wait until the temperature is right, and then hop into the spray. Consider putting your controls as far away from the showerhead as possible. You’ll thank yourself every morning for it. 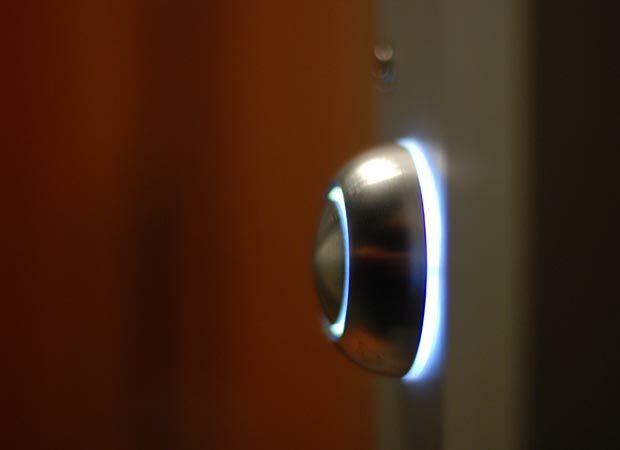 The other issue relating to controls is which type of user interface to go with. Most showers these days are controlled from a single knob that turns the water volume and temperature up simultaneous in a clockwise motion. It sickens me that this interface has become standard. I think it coincided with the 2.5 GPM MAX law, the thinking being “why would you ever want the water at anything less than full blast?”. I much prefer a knob for volume and a knob for temperature. That way, the temperature one stays in more or less the same position and the volume one(s) can be turned independently to affect flow. If you are designing a system like this, make sure your plumber knows your intention and make sure you buy the right valves and trim for it. Some plumbers will do this thinking for you. Others will not. Know which type you hired. We put two bodysprays in the shower just to make sure we had the option of using them, but we rarely actually do. They are nice to have occasionally, but I wouldn’t call them a must, especially if you have the Flipside. If you need to cut bodysprays out because of budget or installation challenges, I say go ahead. If you want them, however, maybe go with three instead of two. We went with a special type of glass called Starphire that has much less of a green tint around the edges. It is also a bit more etch-resistant than normal glass because it’s coated with something called Showerguard. It’s nice, and I recommend it, but not a must. The company who fabricated and installed our glass is Distinctive Glass. Radiant heat, in the shower! Since we did electric radiant heating pads underneath the tile in the master bathroom, Build surprised me and ran the pads right underneath the shower tile as well. Very, very awesome. No more curling of toes in the morning while inching into a cold shower. If you’re already doing radiant in the bathroom, there is no reason not to run it into the shower as well. We had a small step built into the shower for leg shaving. You can do this with a wooden stool as well, but if you’re starting from scratch, might as well build the little step. It’s only maybe 6 inches deep, 15 inches wide, and a foot and a half tall, but it gets the job done… or so I’m told. Last but not least, we had a little alcove carved into the side of the shower to hold bottles and other shower-related things. 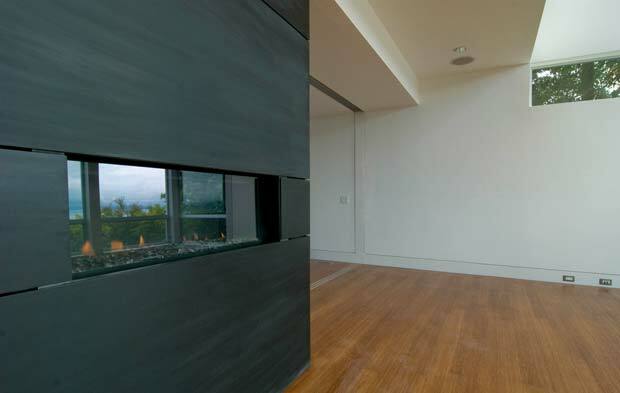 Notably, we specified that the alcove be double-height with a glass shelf in-between. Shower alcoves never hold enough stuff so we were determined to build one that did. And it does. … and those are the elements of a perfect shower. 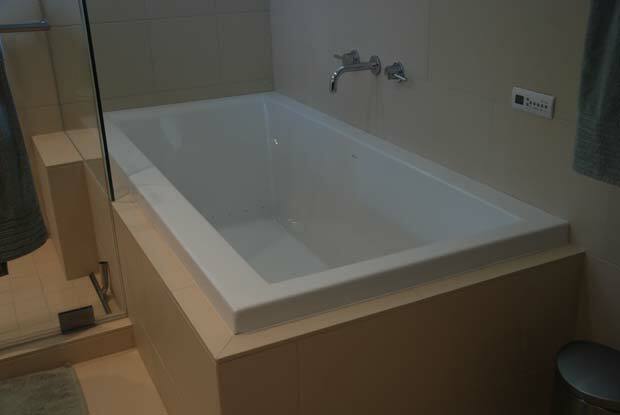 We debated whether or not to have a tub at all in the master bathroom given the hot tub on the roof, but it was only a few thousand dollars extra and there are definitely nights in Seattle which are too cold and wet to want to use mess with a hot tub, so we put one in. We ended up going with a BainUltra Origami, which is an “air tub”. Air tubs don’t use water jets but rather air jets. Because they don’t use water jets, you can safely use bath oils and salts without ruining the system. We call the two tubs Fat Man and Little Boy. I haven’t actually used Little Boy yet, but the girlfriend says it’s the best bath in the world… so there’s that. Also, another bonus about the Origami is it lacks “old man handles”… the ugly clear plastic handles that adorn many popular baths. Using these guidelines, we chose off-white ceramic tile, ran it across the floor and halfway up the walls and then used smaller and grainier versions of the same for inside the shower. For the backsplash, we went with small glass subway tile. Neric Pro Build did all of the tile installation for a very reasonable price, and with a little bit of coaching and oversight, everything turned out swimmingly. Sinks are largely a personal affair, but we found what we wanted with these Ronbows. Simple, modern, white, and not likely to be dated any time soon. Vessel sinks are nice and all but every time I see one, I look at my watch and wonder how many months until they are out of style. For the faucets, we fell in love immediately with the famous Dornbracht Meta series. What we didn’t fall in love with, however, was the price. I searched for weeks online and around town for a decent Dornbracht knockoff, but every single one had something wrong with it. Too fat, too thin, not the right angle, etc etc. None of them matched the beauty of a real Dornbracht. Then, I finally found one! It’s called the Taron 101 and it’s available for about half the price of the Dornbracht. We ended up doing real Dorns in the master and three Tarons elsewhere around the house, and I have to say, I almost like the Tarons better. They seem very well built, and for half the price, I’m diggin’ em. If you came in from Google because of that paragraph, you’re welcome. As in the kitchen, we went with quartz countertops in the bathrooms. While the kitchen is Pental Chroma, the bathrooms are Cambria. 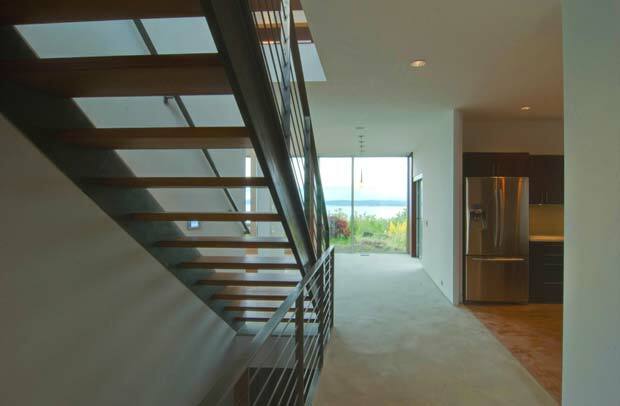 Quartz is affordable, durable, and modern. A perfect fit for our needs. While my friend Danny advised putting audio in every bathroom and I felt like I needed one, we went ahead and wired just the master into the whole house audio system. We don’t use it much, but it’s a good move if it’s on your agenda. Our toilets are Toto Pacificas. Affordable, modern, and a simpler-than-usual design that allows for easy cleaning. Wall mounted toilets are also nice, but we opted for simple, proven floor mounted ones. As mentioned above, we ran electric radiant heating pads underneath our tile. 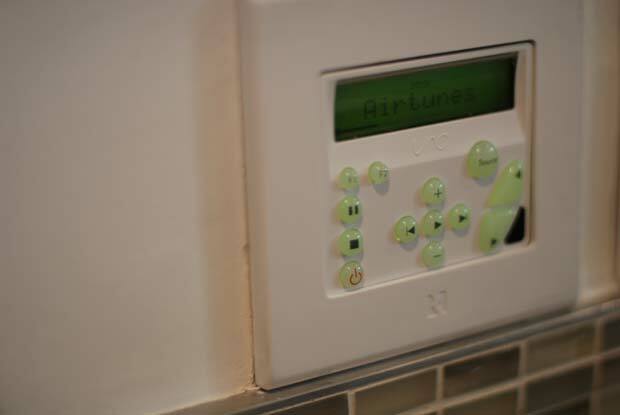 These are on a simple digital timer which cranks the tiles up to 85 degrees or so for an hour or two in the morning and then keeps the heat off for the rest of the day. For several hundred dollars, it’s a worthy addition. 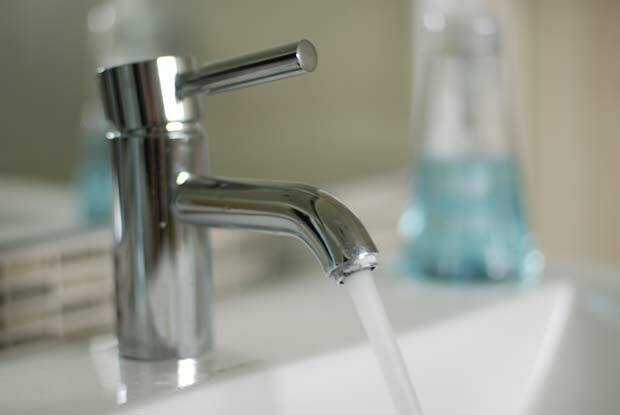 If your master bathroom is far away from your water heater, you’re going to want your plumber to run a “recirc line” from the water heater to someplace near your bathroom. The recirc line is on a timer and runs a fresh supply of hot water close to your bathroom so it doesn’t take three minutes for your shower to get warm. Smaller houses or houses with multiple tankless water heaters may not need this, but if your water tank is two floors below your bathroom, you will get great use out of this little bit of technology. Finally, there is the lighting. 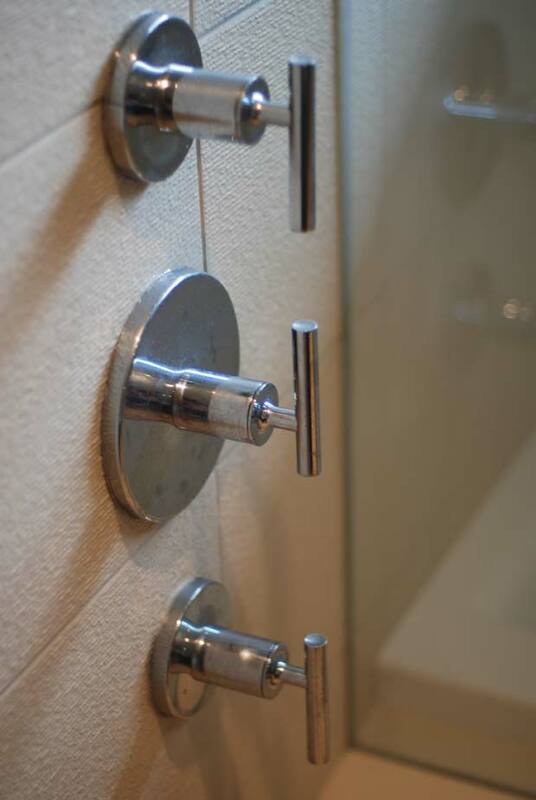 We put standard 5 inch cans in our bathrooms with the notable addition of Alinea bars in our master and powder room. 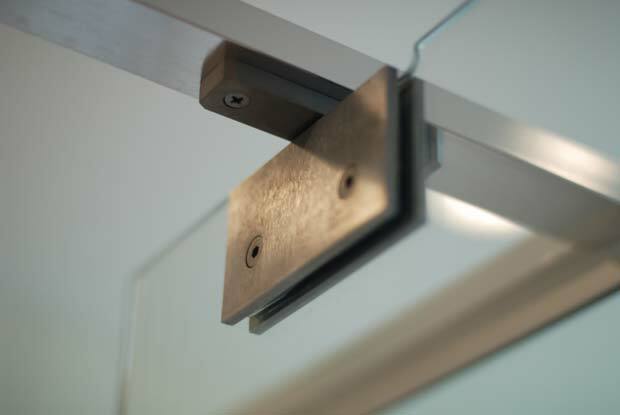 Alineas are seldom-used fixtures that provide an interesting type of lighting: linear incandescence. Think of a long florescent tube but with a nice warm incandescent glow instead of a cold harsh florescent one. We put a long one of these above the mirrors. On the upside, it warms up the space nicely. On the downside, it cannot be dimmed without buzzing so it’s either all on or all off. Some people recommend placing lighting on the sides of your mirrors instead of above, but the Alinea seems not to cast the sorts of shadows this advice aims to avoid. And so there you have it… the elements of a well-designed bathroom. Whether you’re building new, remodeling your current place, or just hate your showerhead, hopefully you can apply principles from this post to your own projects. 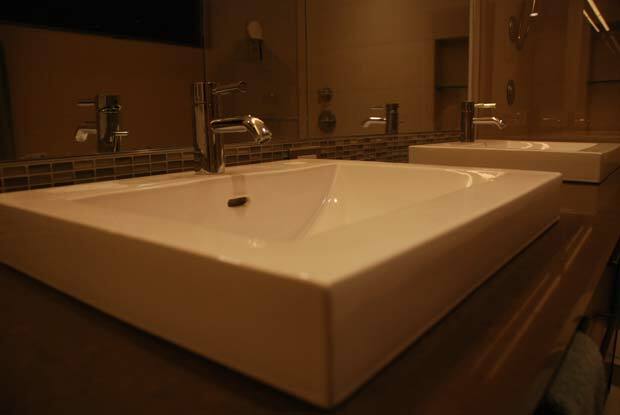 Bathrooms are only about looks when you sell the place or are entertaining… all other times, they are about usability. 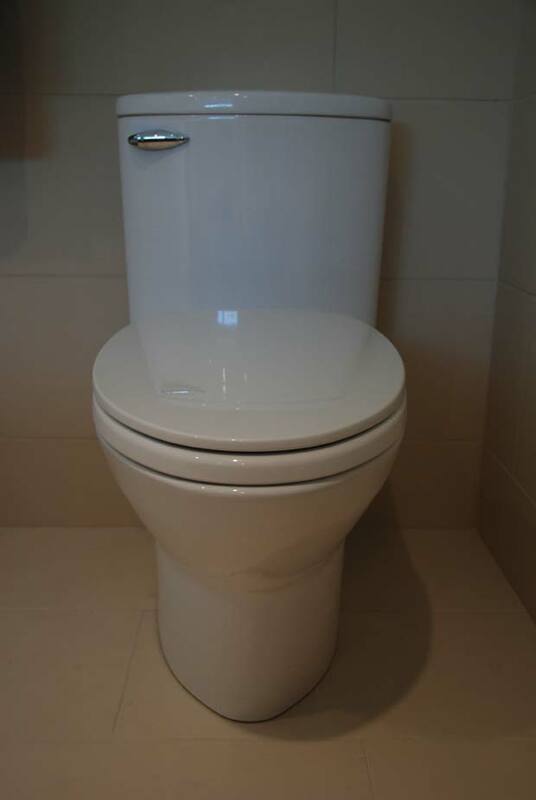 Pay close attention to the usability of your bathrooms and you’ll forward to more of your mornings. UPDATE: For a lot more shots of the bathroom details, check out the Bathroom section in the photo gallery.